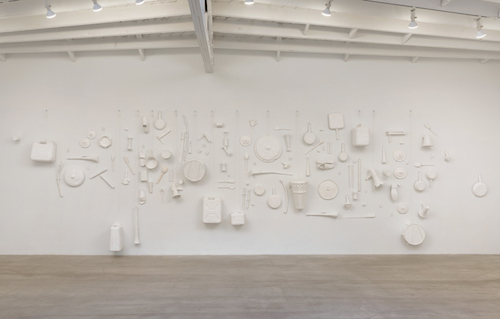 Amalia Pica, (un)heard, 2016, found objects, plaster, gauze, metal, rope, dimensions variable. “I have nothing to say / and I am saying it / and that is poetry / as I need it,” wrote John Cage, one of silence’s loudest advocates. Samuel Beckett said words were a stain on it. For Amalia Pica, the noiselessness between speaking and listening finds, in the blankest of whites, a space for both protest and celebration. Over a hundred makeshift noisemakers, from potlids and jerricans to toy bugles and bike horns, dangle from a long wall in (un)heard, 2016, white gauze shrouding each and all in a paler shade of silent. Leaning in a neat row nearby, the protest signs of Procession (reconfiguration), 2016, bear skinny triangles of colored bunting as their only declarations. Biomorphic sculptures carved from marble, black granite, and soapstone with silicone tubing are scattered across the floor, looking like alien Noguchis, but the shapely bodies of “In Praise of Listening,” 2016, are revealed on closer examination to be giant hearing aids, some marked with model numbers. The A4 sheets of Leaflets, 2009, puncture bright white rectangles in the dull white wall. Hanging alongside them is a brisk typed note describing a 1960s Dutch protest against being forbidden to protest, wherein demonstrators marched with blank signs and handed out blank leaflets. The joke was apparently lost on the authorities, who arrested them anyway. Tucked one room over, authority takes a different shape, with an array of drawings composed of the officious ink of rubber stamps patterned into pictures, Joy in Paperwork, 2016. A Kafkaesque clerk’s silent expression of creative dissent, perhaps—though a mere rubber stamp also has the power to restrict movement across borders. Between the tight lips of a sly smile, Pica’s collection of truly peaceful protest carries the powerful inevitability of a joyful noise.